Burlap valances are an affordable and fashionable solution to decorating windows. These valances help conceal the curtain fittings and provide a sense of elegance to a room. Whether you use them with burlap curtains or flaunt them by itself, they are assured to adorn the windows. They work well in dining rooms and kitchens but manage to look equally good in other areas as well. 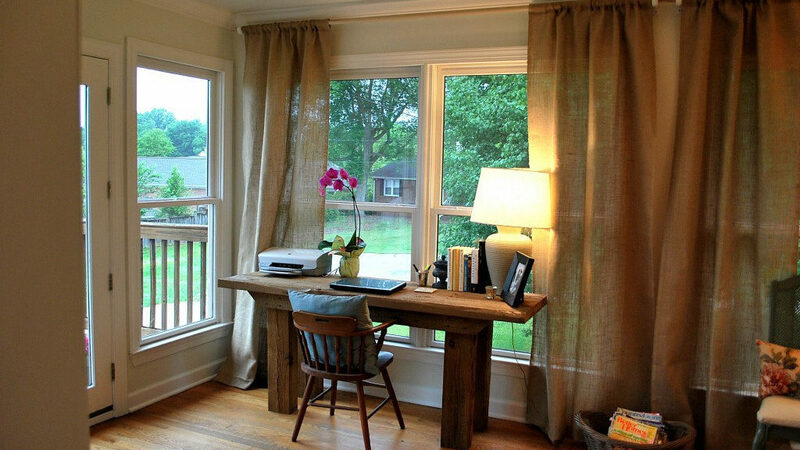 Burlap window valances can be hung solo in small rooms with narrow windows to avoid them from looking overcrowded. The burlap material will help the tiny room look more welcoming and comfy. Various kinds of burlap valances are available in the market like swag, tailored and even the ruffled variety. Ruffles or frills add a fun and vivacious character to the simple burlap fabric. The ruffled burlap curtains draw a lot of positive attention and generate a lively ambience. They are perfect for the children’s room and look quite charming in other bedrooms and bathrooms as well. Burlap curtains with just ruffles at the bottom look pleasant and not too flamboyant. You could make use of one or two shades of colors. A mix of different colored frills will add more excitement and are perfect for the kid’s room. Burlap fabric is inexpensive and easily available in the market. This fabric can be used to make several items including curtains. Making burlap curtains via no-sew method from scratch is very easy and requires some basic items. Based on your window measurements, cut out the fabric. Place your fabric on a blanket to protect the work table. Next to create a rod pocket, fold about 6 –10 inches from the top and pin that section. Now stick stitch witchery in between the fold and iron the fabric. The iron needs to be hot for the tape to stick to the fabric. You could repeat the steps for the bottom and sides if you want. Once finished you can insert the rod into the rod pocket and hang your curtains. Burlap curtain tie backs are easily available in the market for a reasonable price, but these can also be made at home in a jiffy with some burlap fabric. In fact, when you make them at home you can get a lot more creative and decorate them according to your needs. To create a fancy bow curtain tie back, take a piece of burlap fabric and make a big bow out of it. Next stick this bow with the help of some hot glue to another piece of burlap cloth and your product is ready. Similarly, you could stick some buttons, readymade flowers with twine or even hearts to a piece of burlap cloth. If you are crafty enough you could make roses with some burlap fabric and stick them to the tie back with some pearls for a rather sophisticated look. If you have a spare burlap sack and have been waiting to put them to good use, then you should definitely try revamping the boring bag to burlap sack curtains. It might come across as a surprise, but these unappealing sacks do make attractive window treatments. Cut them in half and hang them with the help of clips for a casual look. Alternatively, you could fold a tiny portion and stick it with hot glue to create a rod pocket. Insert the curtain rod in this pocket for a cleaner look. You could turn these sacks into valances or cafe curtains as well. If the sacks have some lettering or coloring, you could just let them be for a raw finish. Alternatively, you could achieve this finish by using some stencils to inscribe certain characters.